The course of true love never did run smooth, and the same often goes for the relationship between online retailers and their customers. While acquiring eternally loyal customers who come back and spend again and again may be the dream, we all know that the reality is rather different - consumers are constantly having their brand loyalty tested by an increasingly noisy, competitive online retail marketplace. This blog post, which accompanies our new cheat sheet on the topic, will explore the win-back email as a means of re-activating once-loyal customers who have dropped off the radar. Who should you send win-back campaigns to? This type of campaign is aimed at customers who have lapsed (they haven’t shopped in some time) or who look like they may be at risk of lapsing (they haven’t shopped in a while - nearly long enough that they might be considered ‘lapsed’). When it comes to mastering the art of the customer win-back email, the biggest challenge is getting the entry criteria for these ‘lapsed’ and ‘at risk of lapsing’ customer segments right and, in turn, being able to identify which of your customers fall into each category. After all, trying to reactivate someone who hasn’t actually slung their hook is a waste of your time, your profit (if you’re offering them a discount incentive to come back) and is likely to send confusing signals to the customer in question. While a good benchmark for high street fashion retailers may be to consider a customer who hasn’t shopped in 6 months ‘at risk’ and 12 months ‘lapsed’, for example, the only way of truly establishing which figures to use is by consulting your data. By using techniques like order gap analysis, which tracks the average time between consecutive orders across the entirety (or segments of) your customer base, you can start to make accurate guesses about when a customer is likely to make a follow-up purchase. So if, for example, I sell someone a pair of trousers, I’ll look at the average time it takes other people who have bought trousers to make a follow-up purchase. If the customer in question doesn’t make a purchase within the time I would expect them to, I might start to think about ways of re-activating them. (If the above is giving you visions of a headache-inducing spreadsheet-based horror show, I’m going to put in a very subtle plug for Ometria here, as this type of analysis is something our data scientists do for each of our customers. Our platform also automatically segments each of your customers into these buckets, and enables you to set up and send automated campaigns targeted at them). If you want to put the results of this analysis to the test, consider surveying your customer base and asking them whether they are considering making a purchase in the coming months. 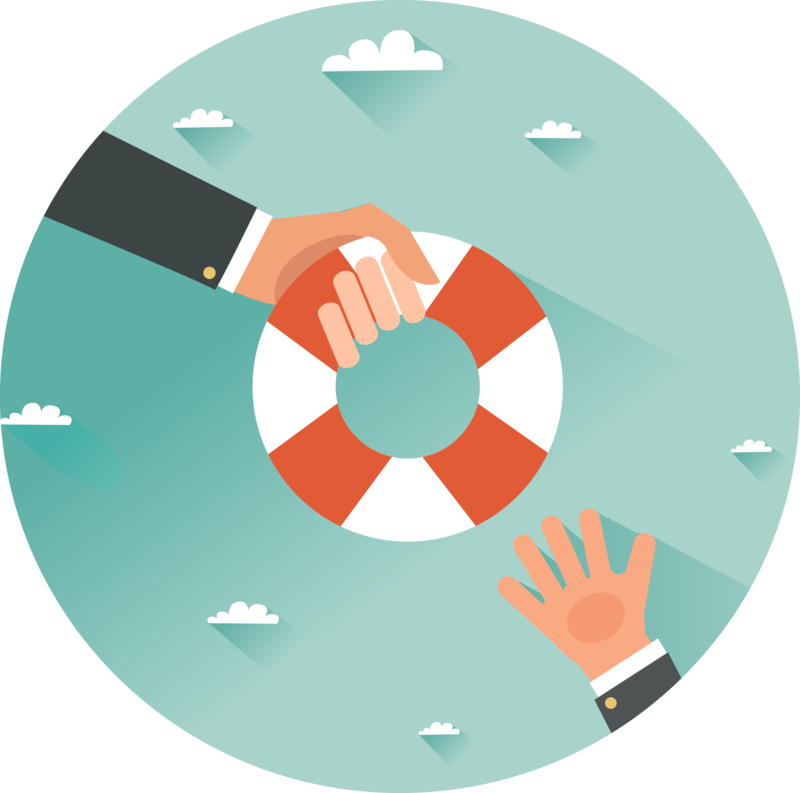 If it turns out that a bunch of your ‘at-risk’ and ‘lapsed’ customers are still in the market for your products, you may want to re-jig your qualification criteria for these categories. So you’ve identified which of your customers have potentially gone AWOL… now what? Time to get cracking at winning them back around. 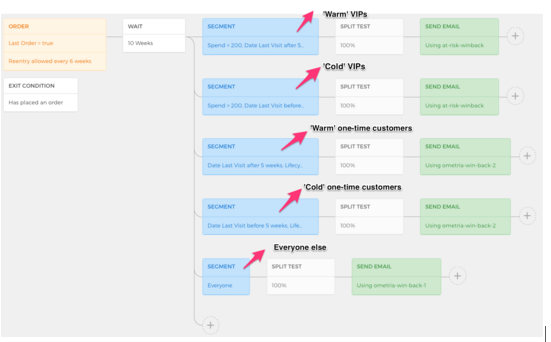 And at this point, marketing automation is your best friend. 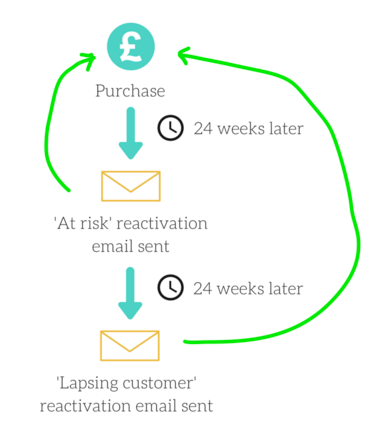 The frequency and aggressiveness of your win-back campaigns is entirely up to you, but here is a simple example, in which customers who haven’t shopped in 24 weeks are automatically sent an ‘at risk’ email aimed at getting them back shopping, and then those who still have not shopped 24 weeks after that are sent a ‘lapsing customer’ email, which may have slightly different messaging and will perhaps offer an incentive. Now we know who we are targeting and when, we need to establish what message you’ll send. ‘We miss you’ - the staple of any good win-back email. Make your lapsing or lapsed customers feel valued by saying, ‘We’ve noticed you’re not shopping any more, and we’re sad about it’. ‘Was it something we said?’ - win-back messages can be a great opportunity to broach any customer service issues, giving you the opportunity to respond and turn the recipient’s frown upside-down. ‘Check out what’s new’ - the recipient of your win-back campaign was an active customer at one point: try and tempt them back by calling them to check out what’s new. ‘We’ve got some products we know you’ll LOVE’ - tempt lapsed customers back by showcasing products that are most likely to tickle their fancy with personalised product recommendations based on the items they’ve browsed and bought. ‘Shop again and receive this gift!’ - incentivise lapsed customers to come back and shop by offering a discount or deal sweetener (though this should be approached with caution - more about this later). For some real-life examples of great customer win-back emails, download our ultimate win-back email cheat sheet - it also includes a best-practice checklist and stats about the kinds of open and click rates and revenues you can expect per email. We all know that segmenting your marketing is a great way of making your messages more relevant and engaging, and the same applies to your win-back campaigns. By lifecycle stage: tweaking the message depending on whether the recipient is considered ‘at-risk’ or ‘lapsed’. For example, you may want to avoid offering a discount or other incentive until your customer well and truly falls into the ‘lapsed’ category. By on-site/marketing interaction: changing the messaging for ‘warm’ contacts who have been active on-site/opening and clicking through from your marketing messages vs ‘cold’ contacts, who you haven’t seen on on-site or interacting with your marketing messages. For instance, you may want to take a lighter touch with warm contacts (perhaps using a ‘can we help with anything?’, customer service-angle), but lay it on thicker (‘come back, we miss you!’) with those who haven’t been engaging with your brand at all. By customer lifetime value: some customers you can afford to lose more than others. Consider setting up a specialised ‘VIP’ win-back campaign that focuses on bringing high CLV customers back into the fold. This campaign could even involve having a customer service rep contact the individual directly. Below is an example campaign set up in the Ometria campaign builder, targeting five specific lapsed customer segments with different emails containing differentiated messages. Targeting customers who haven’t shopped in a while with dedicated win-back emails can be a very effective tactic for reactivating them and extending their lifetime value. Order gap analysis is a good method of figuring out when you should consider a customer ‘lapsed’ or ‘at-risk’ of lapsing. Marketing automation, triggered by the date of last purchase, is a great way of delivering win-back emails for busy marketing teams with limited resources. Download our ultimate win-back email cheat sheet.